The long weekend is almost here, woohoo! I don’t even mind that it’s supposed to rain all weekend. 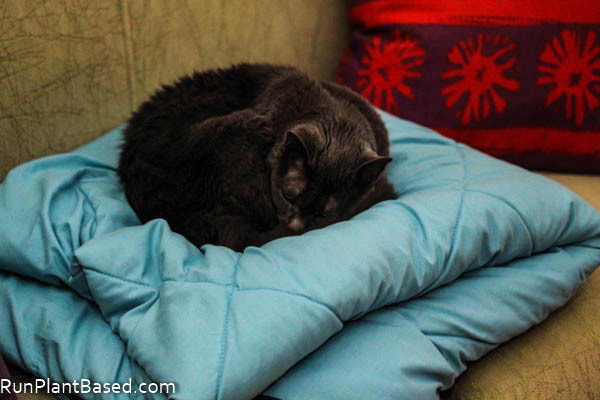 Neither does Smokey as long as she has her favorite couch blanket. 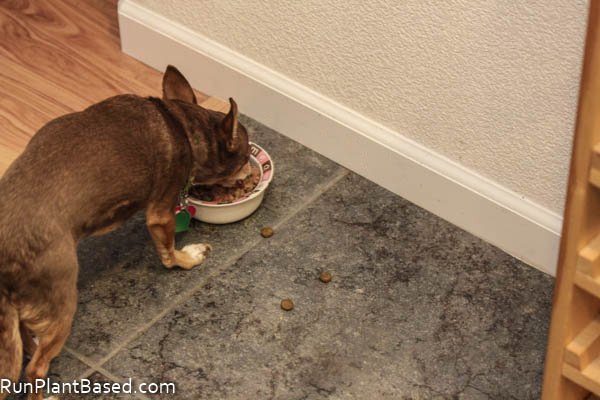 Leela is funny about eating V-Dog kibble, she likes to leave little bits outside the bowl and comes back for them later. 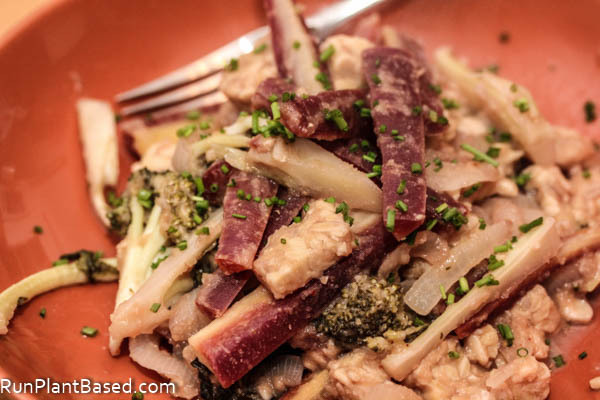 For me, when it comes to a ginger tempeh stir fry, there is nothing to come back to later! 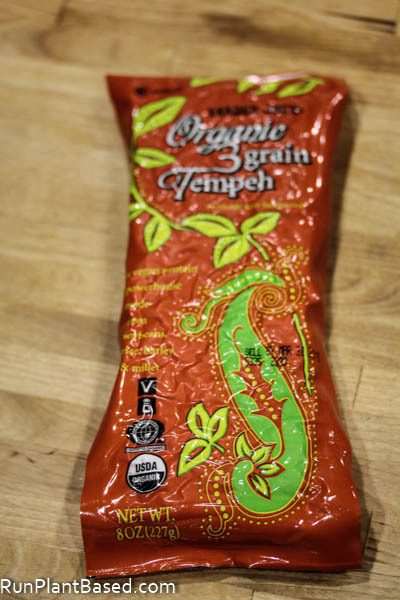 We go through a lot of tempeh in this house, I usually by 2-3 packages of the organic stuff from Trader Joe’s a week. It’s cheap, has a long shelf life in the fridge, probiotic, and such a simple and versatile source of protein and fiber. My favorite use is in an oil free stir fry and I know oil free is not for everyone, it’s an adjustment cooking that way at home. 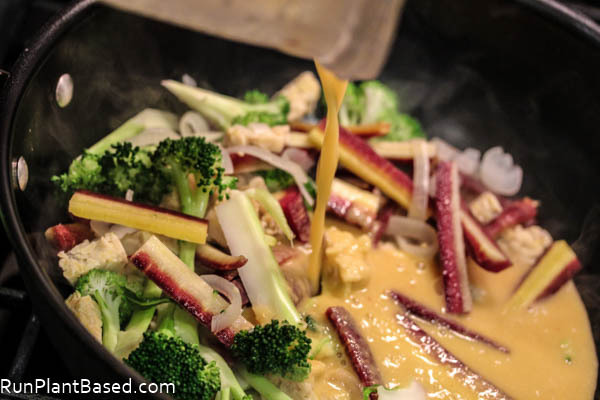 But I usually put a little water at the bottom of a wok to simmer tempeh and veggies in. Then mix in the sauce and seasoning and cover to simmer for a few minutes or so – simple, fast, and healthy which is perfect for a busy week night. You probably won’t miss the oil with this simple blender stir fry sauce loaded with ginger, miso, tangy vinegar, and a little sweetness. Place all ingredients into a high speed blender and blend to a smooth and creamy texture. 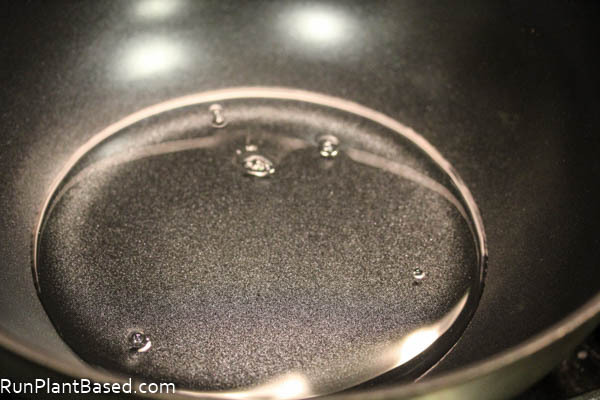 Pour into a stir fry mixture in a wok over high heat and thoroughly blend in while stir frying. Cover and simmer for a few minutes if needed to cook ingredients. Serve and enjoy! Makes 2-4 servings. 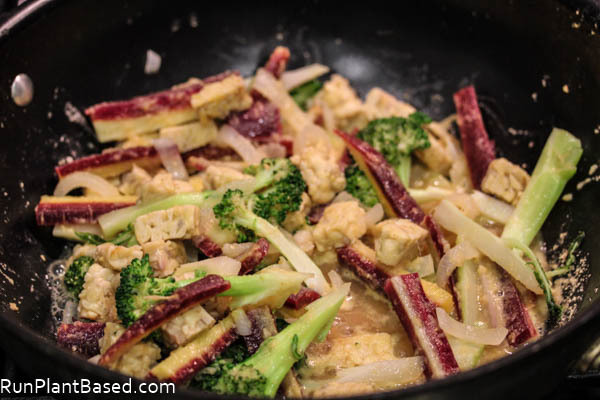 I stir fried chopped tempeh, rainbow carrots, broccoli, and onion with the sauce for a simple one pot meal. You could use canned chickpeas, tofu, and just about any combo of fresh or frozen veggies you have on hand too. Thoroughly stir fry the sauce in and cover to simmer for a few minutes to merge flavors and steam the veggies. Simple week night dinner is ready! 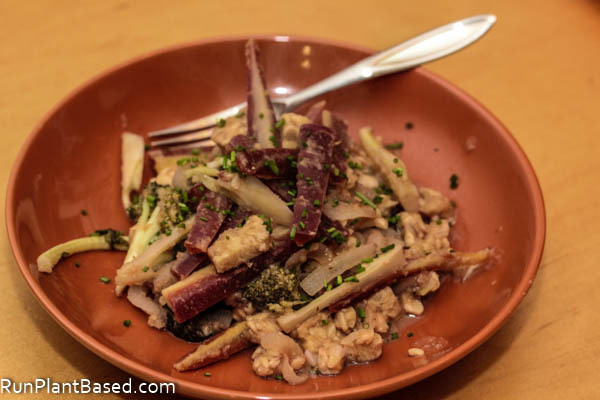 The tangy ginger flavor is the perfect amount without being too strong and the slight sweetness in the sauce adds a fun flare to the veggies and tempeh. And it’s just a colorful and cheery dish for a gray winter day. Tempeh is amazing and such a good price at Trader Joe’s. You too, have a great weekend!